Some aliens, the Zimen, have taken control of the space station Orion. 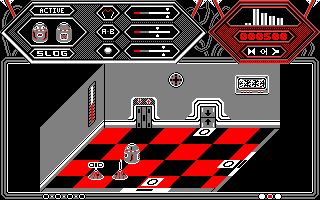 You must guide four robots through a maze of rooms to find a way to get rid of them. The plot isn't very original, as a lot of other games use the same storyline. You can shoot at aliens, but they will quickly spawn again from nowhere and your ammunition is limited! You have to find power sources too, in order to continue your progress. Your four droids are exactly the same and it's impossible to elaborate some kind of strategy. The graphics are poor and the gameplay is far too irritating to make you want to keep trying to explore the base for more than a few minutes. Every so often, the Strategic Air Command organise the Curtis LeMay trophy (although I don't know whether this is fact or fiction!). Choosing one of four types of fighter aircraft, you must take part in eight bombing missions, armed with a cannon and Sidewinder and Maverick missiles, which are used on air and ground targets respectively. What makes this flight simulation so good is that you see everything in solid 3D, and as a bonus, you can view your plane from any angle you want; it's great stuff! 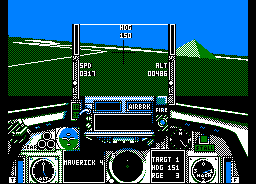 Unfortunately, you can't choose which missions you wish to fly, and of course there are all the keys to learn, but with great graphics like this, and several practice modes, it might just convert some people into liking flight simulators! Ten nations (only ten?) are taking part in a knockout Olympic tournament consisting of four stages. You have to play as the United Kingdom; you can't choose another team. Each team has only five players, and you initially have three minutes of playing time. If you lose, you're out of the tournament, but if you are drawing or winning, you can continue to play the match for another three minutes. This seems a rather strange rule to me! 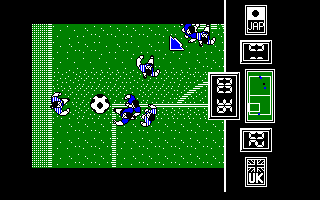 The graphics are quite good, and this is one of the few football games that plays music during the game. The game plays reasonably well, although the scrolling is very jerky and the players are very big compared with the size of the pitch, which becomes confusing when there are several players crowding around the ball. The evil Pharaoh has kidnapped Princess Thaya and is about to bury her alive in a sacrifice to the Egyptian gods. You must cross the desert to reach and save her, but many monsters and demons must be fought and defeated using your trusty sword. You may find some magic objects along the way as well, but some of them may release evil magic. The animation of both your character and the monsters is excellent, and the graphics are very innovative considering the year this game was released, using two different screen modes and a multi-coloured border. However, the music is dreadful, and there is no variety in the gameplay; the entire game seems to consist of nothing but fighting and defeating monsters. If you don't know what this coin-op is about, it's likely you didn't play video games around 1990. Just choose your hero, knock down anyone standing in your way and rescue the girl. US Gold attempted the impossible in this conversion, and so they didn't manage to fulfil their objectives. The graphics are quite big, you'll see almost the same enemies, the same background graphics, the same character movements... and you'll see all these things scrolling just as they did in the original game. As a result, the game has very little playability. 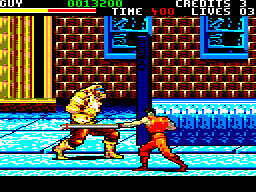 Nevertheless, I can't say Final Fight is a bad game; let's say the programmers did all they could to code a CPC version of the game. It's quite curious to see, but it cannot be considered a real choice if you want to play a beat-'em-up. Watch YouTube videos of this game by: Novabug (gameplay), Novabug (longplay), Xyphoe. Nimrod the Biopton has been sent to rescue his comrades who have been taken hostage by the evil Cratons. Each of his fellow Bioptons is being held captive in a network of Matrices, but they are heavily defended, and you must watch out for alien guards, disruptors and mines. You are armed with one of three types of weapon, and you can find more weapons within each Matrix, as well as thrust packs which are useful for flying around. However, your weapons have little effect on the alien guards and it's extremely difficult to dodge them and their bullets. As a result, most players will be unable to make any progress at all, despite the benefit of being able to visit any of the Matrices at the beginning of the game. 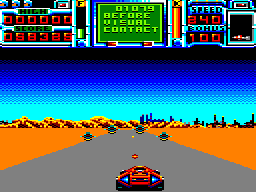 There are few sound effects, the graphics are very Spectrum-like, and the scrolling is jerky. This is the first game which stars the fearless Magic Knight, who has been placed in the Castle of Spriteland by the King and has to escape from it while grabbing as much treasure as possible, to prove worthy of a place on the Polygon Table. All manner of objects are to be found in the rooms and mazes, which you can trade for cash. Some of them can also be combined to make more valuable objects. 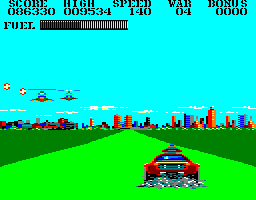 The graphics are a bit blocky and the music, while reasonably good, is grating after a while. 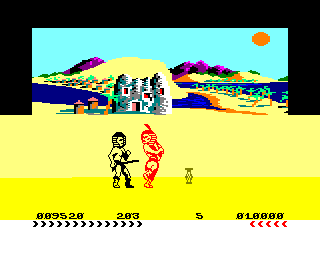 It's certainly not my favourite Magic Knight game but it's worth the occasional go, even if it's a little bit too easy. See also: Knight Tyme, Spellbound, Stormbringer. 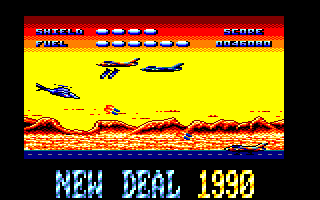 Fly your helicopter through six missions, across jungles, cities, deserts and ice, shooting planes, helicopters and ground targets with a barrage of missiles. Shooting helicopters produces a bonus which you can collect to give extra fuel or firepower. The graphics are really wonderful, although the sound effects are very limited and the music at the beginning of the game isn't all that good. In fact, the programmer is one half of Black System, who produced many excellent listings for French CPC magazines which featured colourful graphics, but had one problem – they were too easy. That's also the case with this game, since you are offered infinite continues, and it's very easy indeed to complete! It's still fun to play while it lasts, though. In a world in the future which is raging with conflicts in every continent, the United Nations uses armoured Thunder Master vehicles to resolve them. However, the Intergalactic Liberation Organisation regularly attacks the vehicles. There are three levels with six wars on each of them, and you can start on any level. Each war takes you along a stretch of road, where you will meet enemy fire. Collisions with obstacles and bullets loses fuel, and you constantly need to collect the fuel which lies on the road, or the game is over. Unfortunately, you often find yourself being destroyed very quickly, and the game ends almost before you know it. It's a real shame that a game with nice graphics and sound effects (the digitised music on the title screen is excellent!) is ruined by the ridiculous, and random, difficulty. See also: Fire and Forget II. More terrorist-busting antics await you in this disappointing sequel. The 3rd International Conference for Peace has been gatecrashed and a nuclear bomb has been placed inside the conference building. You control the new, improved Thunder Master II vehicle, with the ability to fire missiles and convert from a car to an airborne fighter. This time, there are five levels which become progressively longer; too long, in fact. You need to collect fuel, kerosene and missiles for the vehicle, and collisions and running out of fuel costs you one of your six lives. At the end of each level is a truck which you must destroy. The graphics are just as good as in the original game, and there's plenty of cool music to listen to as well. However, the very long levels make this a boring game with little variety. See also: Fire and Forget. 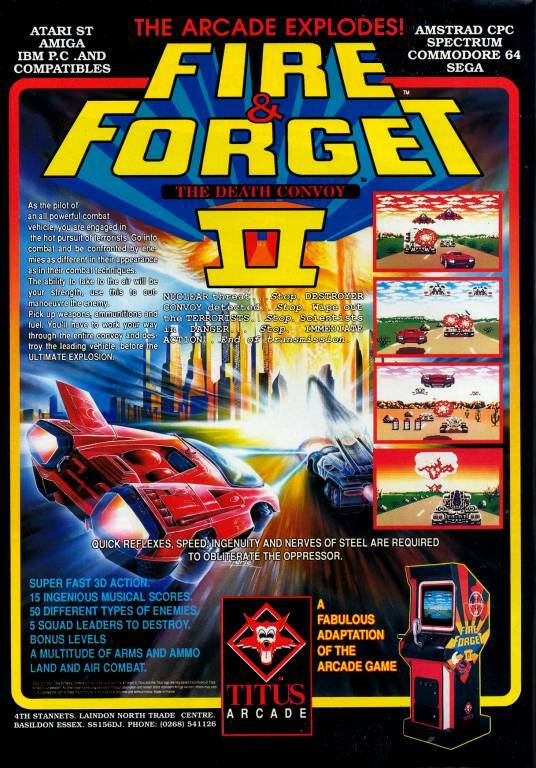 Watch YouTube videos of this game by: Novabug (cartridge version), Xyphoe (cartridge version).